Chris Pine is quietly having himself one hell of a late-blooming career. I say ‘quietly’ knowing that he’s a Hollywood heartthrob, a household name, and that he’s red carpet famous. I say ‘quietly’ because the guy is 36, he’s no young stud trying his hand at acting, and if you look at his recent filmography you will come away shocked by the number of high-quality films he inserts himself in. Star Trek, Star Trek Into Darkness, Into the Woods, Z for Zachariah, Hell or High Water, Star Trek Beyond; these are some of the best movies of the last few years, sci-fi, musical, and dramatic films that are a credit to everyone who was a part of them, let alone the same man who starred in each. Chris Pine is not just a good-looking talent, he’s one of the strongest actors of the 2010s, and when The Finest Hours is probably the worst movie you’ve done since you became famous, you’re doing something right. In the winter of 1952 off the coast of Massachusetts, a storm would hit that would kick up waves higher than anyone had ever seen before, winds howling with ferocious speed, temperatures dropping rapidly. In the storm, multiple ships & tankers were distressed, requiring the local Coast Guard to send out rescue parties in all directions. But when a tanker was literally cut in half by the pressure of the raging sea, the rear end was set adrift with no means of calling for help, and no hope of making it through the night. As the crew scrambled to stay afloat & contact the shore, a team of four brave Coast Guard members set out in a small boat to lend whatever help they could, a suicide mission that would become the stuff of legends. I was so sure, during the first half an hour, that this film would be everything I was hoping for. A true story, well-acted, imminent disaster, a Perfect Storm type film but much better executed. And for a while it was all coming true; Chris Pine was excellent, the accents were cool, the plight of the crew on board the sinking tanker was intense & intriguing, led by a stellar Casey Affleck. But then the action began and it all went downhill. Pointless scenes with the girlfriend at home, the same shots of waves over & over again, and some of the worse CGI I have ever seen, comically bad when the emotion should have been at its highest. The supporting cast was so cheesy; Eric Bana the Southern chief who didn’t fit in, Ben Foster who is usually so reliable, John Ortiz with the worst performance of the decade, John Magaro who I love but who failed miserably in his given role. Disney lost control of this film, and perhaps never had the ability to pull it off, as, in the end, it felt exactly like the movie it should never have been. 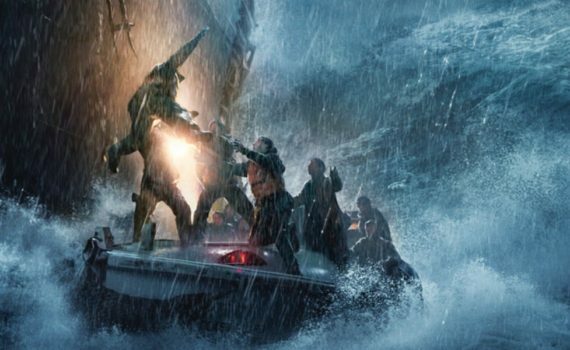 Without Chris Pine and without the nice, solid setup, The Finest Hours may very well have become The Baddest 110 Minutes, dodging a bullet perhaps, but not quite surviving unscathed.